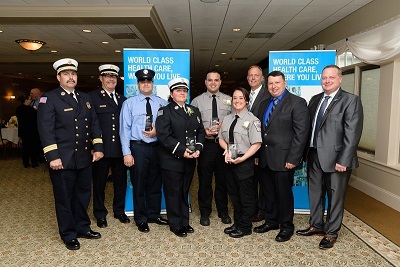 Fall River, MA – In celebration of National Emergency Medical Services (EMS) week, Steward Health Care hosted the second annual “EMS Stewards of the Community” award ceremony on May 22 at the Tirrell Room in Quincy, MA. Boston-based Steward, which operates nine hospitals across Massachusetts, recognized 22 EMS providers. Among these were members of Fall River EMS, including firefighter Sterling Hudson, of Fall River, paramedics Lucas DeAraujo, of New Bedford, and Brittany Carlson, of Tiverton; and paramedic lieutenant Jennifer Farias, of Tiverton. They were recognized for “going above and beyond” in their interactions with patients at Saint Anne’s Hospital. Among those celebrating the "EMS Stewards of the Community" awards were (left-right) Timothy Oliveira, director of EMS, Fall River Fire Department; Fall River Fire Department Chief John Lynch; firefighter Sterling Hudson; paramedic lieutenant Jennifer Farias; paramedics Lucas DeAraujo and Brittany Carlson; Michael Bushell, president, Saint Anne's Hospital; Ron Audette, EMS manager, Saint Anne's Hospital; and Brenden Hayden, vice president of EMS, Steward Health Care. The “EMS Stewards of the Community” awards show appreciation for emergency medical responders, emergency medical technicians and advanced emergency medical technicians, and paramedics who not only carry out the noble work of caring for others, but do so with a high degree of expertise, professionalism, and compassion. An internal committee of physicians and EMS directors selected recipients among current providers in communities served by Steward. Mike Timlin, former Red Sox relief pitcher and four-time World Series Champion, delivered the “Stewards of the Community” keynote address, sharing his first-hand account of being present at the open air concert in Las Vegas last October where a gunman fired 1,100 rounds from his hotel window into the crowd, killing 58 people and wounding 851. Timlin recounted the heroic efforts of the EMS responders and how seamlessly they worked together to save lives in a moment of crisis. A member of Steward Health Care, Saint Anne’s provides nationally recognized patient- and family-centered inpatient care and outpatient clinical services to patients from surrounding Massachusetts and Rhode Island communities. Recent recognitions include “Straight A’s” for patient safety and the 2017 Top Hospital award from the Leapfrog Group; Women’s Choice Awards as one of America’s best hospitals for cancer care and orthopedic care; the Patient Safety Excellence Award and Outstanding Patient Experience Award from Healthgrades; and the Hurst Gold Standard of Nursing Award. In addition to comprehensive diagnostic, emergency, medical, and surgical services, Saint Anne’s key services include robotic-assisted surgical capabilities; Saint Anne’s Hospital Regional Cancer Center; the Center for Orthopedic Excellence; ambulatory surgery centers in Attleboro and Dartmouth; the Center for Pain Management; and inpatient geriatric psychiatry services. Steward's unique health care service delivery model leverages technology, innovation, and care coordination to keep patients healthier. With a culture that prioritizes agility, resourcefulness, and continuous improvement, Steward is recognized as one of the world’s leading accountable care organizations. The Steward Health Care Network includes thousands of physicians who help to provide more than 12 million patient encounters per year. Steward Medical Group, the company's employed physician group, provides more than 4 million patient encounters per year. The Steward Hospital Group operates hospitals in Malta and states across the U.S., including Arizona, Arkansas, Florida, Louisiana, Massachusetts, Ohio, Pennsylvania, Texas, and Utah.